This engraving ca. 1860 (by H. Cook) is made after a painting by the English (?) painter J. Bostock, entitled "Katherine Airlie". 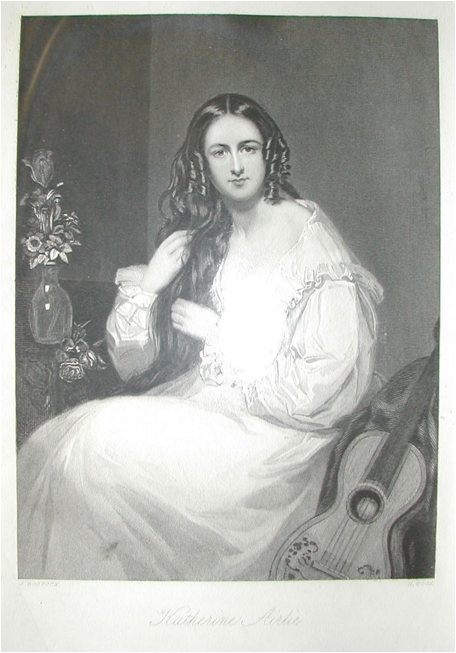 Katherine Airlie has by her left side a highly ornated guitar of an early Italian type. Among the old traditions of my own family, is one which always interested me greatly. It is of a gentleman whose name was John Vavasour. He was handsome, and of good fortune; and, about the age of five-and-twenty, married a young lady from the north, by name Katherine Airlie. She was of a good family, but without fortune; singularly handsome, and of the most amiable manners. Vavasour was of dissipated habits, and lived much in London, associating with the gayest men of the time. He never acknowledged himself as married, but kept his wife, whom he treated with great neglect, and even cruelty, at a small house in Huntingdonshire. His dissipation led to his ruin; and with broken health, and sorely diminished means, came remorse, and some kindly affection towards his unoffending and ill-used wife. Like the prodigal son, he returned, intending to atone for so many years of unkindness; but he came too late; she had been buried only a few days, having died, as was believed, of a broken heart. His distress of mind at this unlooked-for event, overturned his reason, and for about seven or eight years thereafter, he was inmate of a madhouse. His latter days, however, were calm and comfortable. The beloved chronicler of my family histories knew him, in her early youth, as a remarkably well-dressed. but taciturn old gentleman, living with two servants in Hammersmith; employing himself in the cultivation of vines, and of balsams, then lately imported into this country. She remembered also, to have seen a portrait, said to be that of Katherine Airlie, otherwise Mrs, Vasavour, and from her description, it could not be unlike the beatiful face to which I have here given her name. Dark shadow o'er my soul doth fall! Thou never spakest word unkind!